Right now I am sitting somewhere in Frankfurt, Germany. Hopefully with a nice German beer and plate of sausage in front of me. But while I’m off on vacation, I didn’t want to leave you feeling abandoned. So a few weeks ago, I mustered up some courage and asked 5 of my favorite bloggers if they would help me out by doing some guest posts….and let me tell you they stepped up to the plate. I gave them carte blanche to come up with whatever they wanted (well, except for one. I kinda asked her if she would stick to Tex-Mex, Mex-Tex) and they did not disappoint. First up, I am honored to introduce you to Christine of Texana’s Kitchen. I first stumbled on a post of hers entitled Meat and Potatoes, and Men With Big Guns and the way she wove her story hooked me. 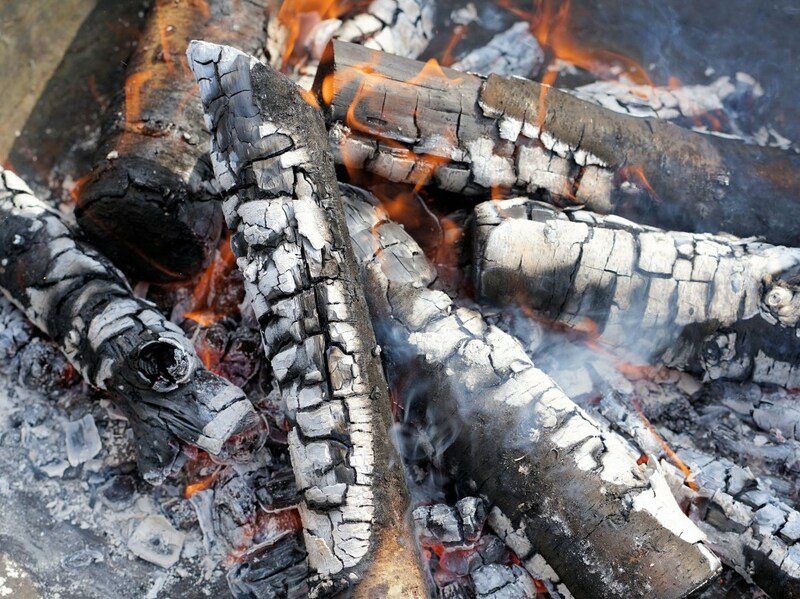 I could picture sitting around a campfire on a ranch both as a Family Man and a Party Animal. I had to read more and went back and explored her blog and have been reading it ever since. Turns out we have a lot in common, both growing up in the same town and holding a lot of the same opinions and values. I hope you enjoy what she has prepared here for you and if you like what you see, please go visit her site. You won’t be disappointed. So without further ado, I’ll turn this over to Christine. Well, Y’all, I am doing it. Breaking a vow. I told myself I would never do a guest post. But here I am. What brought me to this, you ask? Well, Texanism. Yep. I am sure that’s a word, don’t bother looking it up. The reason I wouldn’t consider guest posting before is because I hadn’t found any blogs close enough to my style and taste that I would allow them to gust post on mine. And if I couldn’t reciprocate, I wanted to avoid a one-sided relationship. Then I wound up meeting this trio of other Texas bloggers, Jason being one, and found we all had the same outlooks on many things. Our tastes, our attitudes towards food and blogging etiquette. Our appreciation for meat and alcohol. I am proud to call them friends, and have a blast with them. And truly, I am honored that Jason trusted me with his blog while he is pounding brews and eating schnitzel in Germany. I hope Mrs. G gets a few pictures of him in Liederhosen—she can really use it to her advantage if she needs some extra honey-do’s done around the house. Jason and I grew up in the same town, but I went to the AWESOME high school, and he went to the other one. We might have even crossed paths at some point—like maybe when some of the boys from my school stole the tiger head from the front of his school and hung it from the Harbor Bridge. Mustangs rule, Tigers drool. I’m just sayin’. Regardless, I was glad to discover Jason and his blog, because Jason is a HOSS at the grill. I dabble in BBQ, but Jason plays at it like Picasso played in oils–a true pitmaster extraordinaire. I love his meat-centric focus—because we live in Texas, by God, and a vegan in Texas is like a fur coat in Miami. He also seems to share my appreciation of bacon, which in my humble opinion makes everything better. Yes, yes, I know. Bacon IS meat. But, bacon is such a provocateur, that there are vegetarians out there that make an exception for bacon. Vegetarians. That eat. Bacon. Doesn’t that sound sort of the same as someone saying, “I don’t do drugs, except for heroine”? So I figured the best way to honor the spirit of Griffin’s Grub while Jason is away would be to cook something made of meat. And bacon. On a grill. In a large skillet over medium heat, saute peppers and onions in butter until softened. Set aside. On a large piece of plastic wrap, press sausage into a square about 1 inch smaller in diameter than the bacon square. Top with a square of crescent roll dough (4 rolls), carefully pressing the sides. 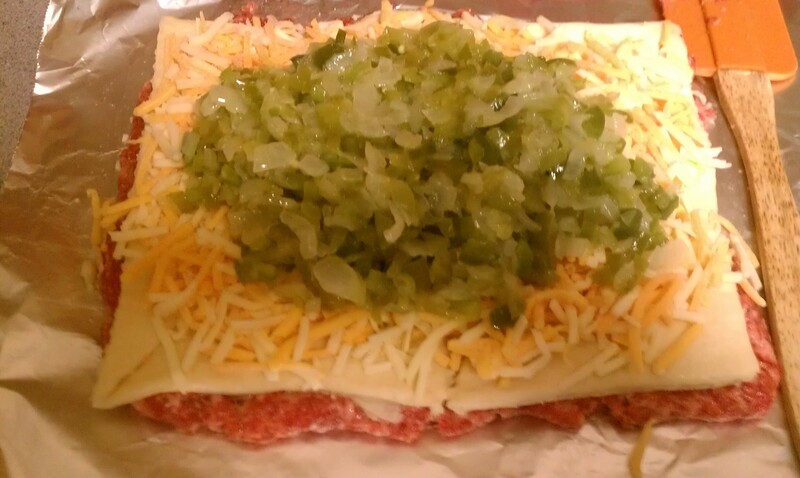 Top with cheese and onion/pepper mixture. Using the plastic wrap to assist you, roll up jelly roll style, starting with a long edge. Massage the sausage into place to cover the seam, and the edges. Very carefully roll the sausage roll onto the center of the bacon lattice. 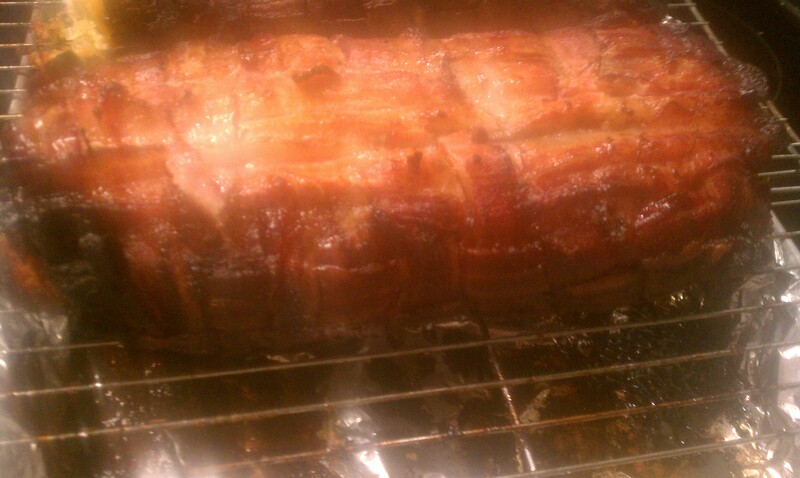 Using the foil under the bacon, lift each side of bacon up to the top of the roll, peeling the foil back and away. 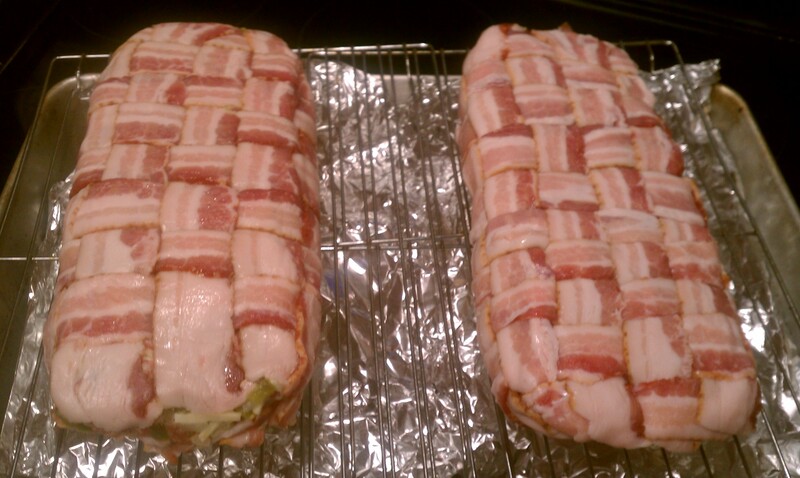 Carefully stretch the bacon so that the ends of it overlap on each other, and the ends too. Cover with plastic wrap. Place refrigerator on baking sheet overnight. On a medium hot grill (not over direct flame), or in a 400 degree oven (set on a rack roaster), cook the bacon roll for about 45 minutes, or until bacon is nicely browned and crisped up. Remove to a serving platter, and let sit for 10 minutes while you prepare the eggs. Either poached or fried. 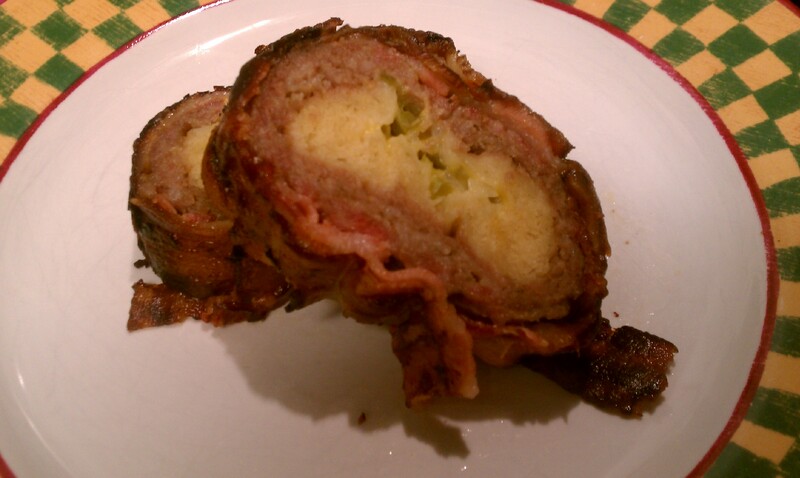 Slice roll into 1 inch thick slices, and serve with an egg on top. Thanks for staying in touch! Talk about going to the extra limit! Wow. Have a great vaca and come back with some good stories and recipies! If we don’t see a pic of Jason in liederhosen, I will be very disappointed. Thank you so much Christine for guest posting for me while I’m off drinking beers and eating sausage. So far I have not been able to find any liederhosen, but I must admit I have not been looking that hard. As for the rest of my reader’s, go check out Christine’s blog. 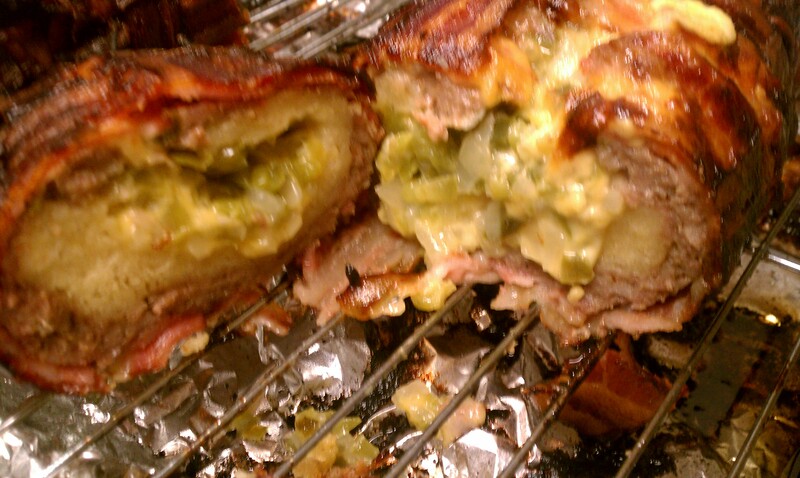 She also has a recipe for a cinammon roll fatty cooked on the Bar-B (as she calls it). In either case, the breakfast bacon roll looks simply decadent. 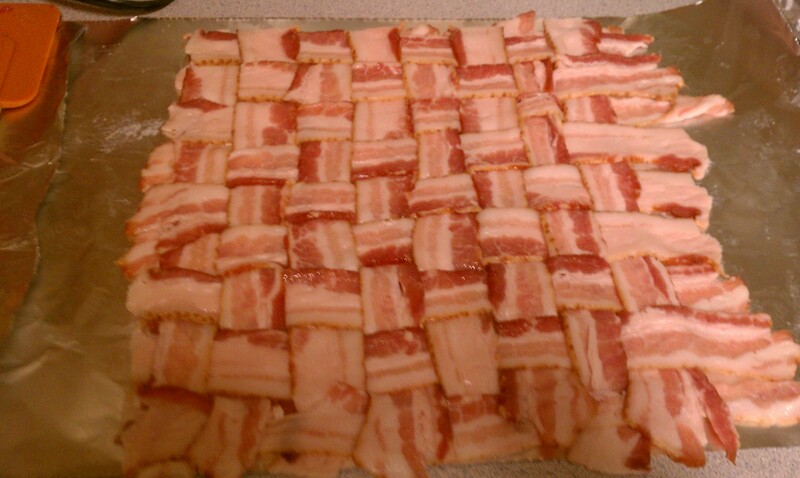 The bacon blanket alone looks so good I’d be tempted to wrap myself up in it! I wonder if you could replace the croissant dough with scrambled eggs instead. I’ll bet that’d be good too.